Repair, cleaning and conservation any hand-made rug is a specialized job which requires knowledge of the item and an understanding of the restoration process as to what can and cannot be achieved. Lida Lavender brings her wide knowledge of the subject to this field. For cleaning, she has an excellent team of cleaners for specialized cleaning and stain-removal. During the process of the repair, depending on the extent, Lida will keep a close eye on the progress. Her eye for detail will undoubtedly ensure a first-class result. We will give you an estimate and the length of time it will take, but it is important to understand that this can be both a lengthy and expensive process. 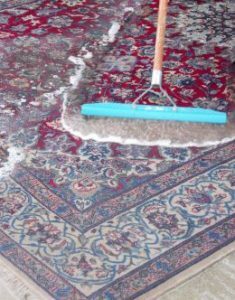 Proper cleaning of any pile rug first requires a thorough dust removal by vacuuming both front and back. Many rugs do best with a full immersion water wash, especially those which have seen much floor traffic. We charge a basic rate of $3 per square foot. For silks, surface cleaning is advised to protect the dyes. We also clean tapestries and all types of flat woven rugs. Loose areas are mesh secured to protect them before any cleaning. Stain removal is available, but results are never guaranteed. 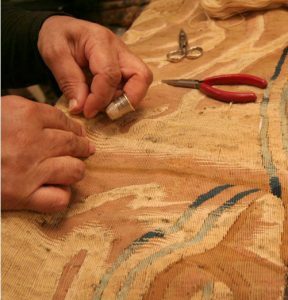 An ancient stain may be set by chemical change so that removal may damage the fabric. The earlier a stain is removed, the better. Carpets should be cleaned everyone to five years depending on location and traffic. They are inspected for any condition problems before cleaning begins. Several types of non-slip carpet pads are available and are priced on a square foot basis. A deposit may be required on all cleaning, restoration and conservation work. Restoring any antique is a specialized job and requires knowledge of the item, together with an understanding of the restoration process and as to what can and cannot be achieved. Lida Lavender brings her wide knowledge of the subject, to this field. She has a team of experienced restorers both in the USA and overseas and she knows where the best results will be obtained. During the process and depending on the extent of the repair, Lida will keep a close eye on the progress and her eye for detail, will ensure a first class result. We will give you an estimate of a repair and the length of time it will take. Certain rugs and textiles should not be restored. They can no longer be safely used as originally intended. However, with proper care, they can still provide beauty and artistic pleasure to their owners. These pieces are candidates for proper conservation. Conservation includes mounting rare, fragile or fragmentary on museum quality frames and providing protective covers if necessary. Other conservation services include backing of vulnerable pieces and the provision of suspension hardware for proper wall display. All materials and techniques adhere to the latest acceptable conservation practices. No glues or other non-reversible processes are ever employed. We also make custom pillows for small rugs, tapestries and textiles, and fragments thereof. Fillings are non-allergenic. Bring in your pieces for a quote or we can create fabulous accent cushions for your interiors.